A few weeks ago, my in-laws invited the fam to join them for lunch at one of their favorite restaurants. As always, I scoured the menu ahead of time, scoping out what my eating options would be. Veganism does have its challenges when eating at a mainstream restaurant. The pickings were pretty slim. It looked like I might be limited to some side dishes, and even those were questionable, as you can never be quite sure how they are being prepared. Clearly, I have developed a bit of a paranoia about such things. Chopped salad, dried berries and honey- roasted pecans tossed in a blueberry- balsamic vinaigrette. Crumbled blue cheese served upon request. After that experience, I understand why some people hear the word salad and run in the other direction. My taste buds were not tickled, and my belly was rumbling within minutes of eating it; I was not satisfied in the least. All the way home, I fantasized about what I would eat for my post lunch snack, which was going to happen the second I walked in the door. Now you need to understand. I love a good salad! I really do. I actually crave good salads. And what makes a good salad? Well, for me, it needs to start with a leafy base. And the darker the better. I prefer kale and spinach, but I do enjoy any of the leafy greens that appear in my CSA box each week. Next up, my salad needs to have some staying power. I don’t want to be hungry an hour or two later. 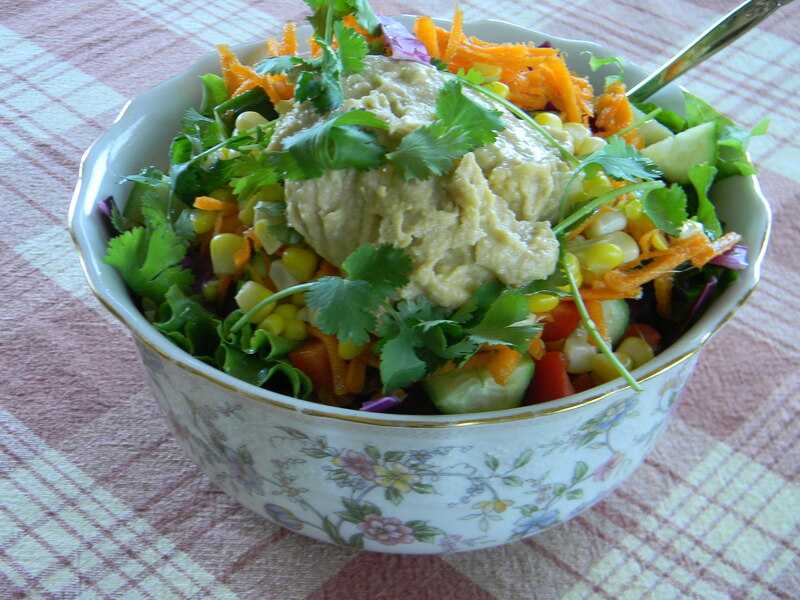 My favorite salad filler of late is hummus (and homemade hummus at that). But, if there isn’t any hummus lurking in my refrigerator, I will throw in some beans…chickpeas, black beans, navy beans, even butter beans. It doesn’t matter. Just open the can, rinse, and liberally sprinkle on top. If I have any grains laying around I sprinkle some of them on as well. Think quinoa, millet, wheatberries. Then I add veggies. This is a great way to clean out your vegetable drawer. If my salad is predominantly kale, I enjoy grated beets (raw) and carrots. If my salad is a little more mainstream, I will add veggies like cucumber, broccoli, cauliflower, red cabbage, corn, peppers, or tomatoes. Sometimes, I have leftover grilled veggies (let’s hear it for mushrooms, onions, and zucchini) that I can add. The more colorful the better, both aesthetically and nutritionally! Then comes the dressing. I ditched bottled dressings a few years ago. But, I have found that balsamics send my tastebuds into ecstasy. Or, I love massaging my kale with avocado and fresh lemon juice, and then sprinkling it with sea salt or sea kelp. Somebody has a problem! There is even one bottle hiding out of sight. Finally, I sprinkle some raw seeds or nuts on top: sunflower, pepitas, pecans, even hemp. If I really feel like living life on the wild side, I’ll add some dried or fresh berries. Some salads require a few sprigs of cilantro or parsley for extra flair. 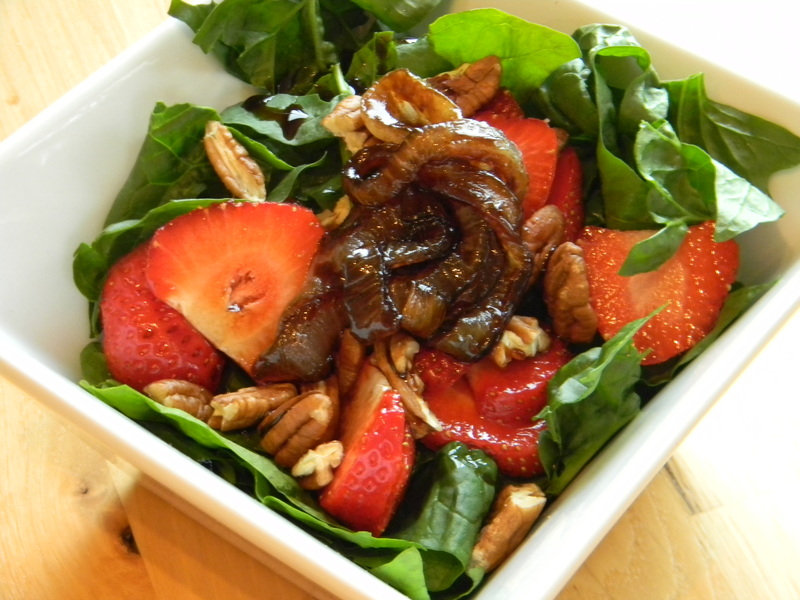 CSA spinach with freshly picked strawberries, onions caramelized in balsamic, and a handful of pecans! 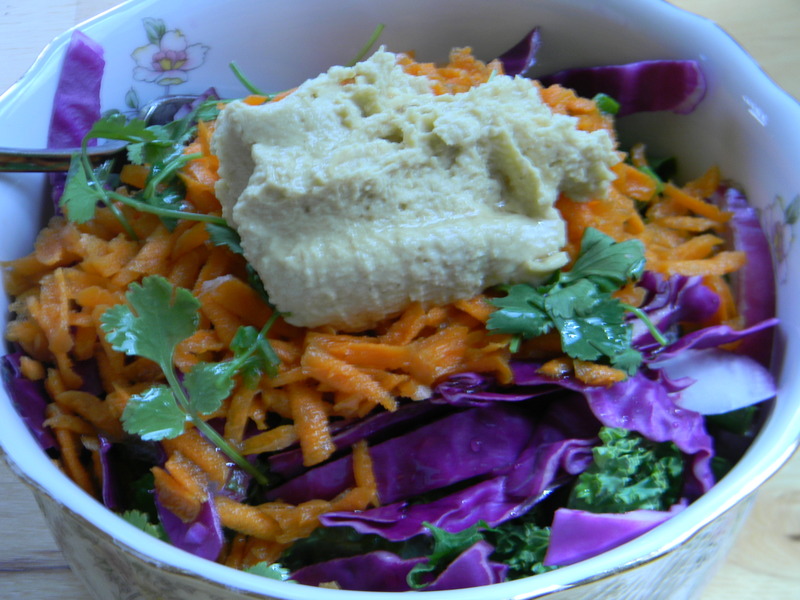 Kale and red lettuce, topped with grated carrots, red cabbage, homemade hummus, and cilantro. Then a healthy drizzle of cranberry pear balsamic. Spinach and red lettuce covered with cucumber, red pepper, corn, grated carrots, a dollup of homemade hummus and a few sprigs of cilantro. I can’t remember what flavor of balsamic I put on this. Kale massaged with 1/2 avocado, 1/2 fresh lemon, and a sprinkle of sea salt. 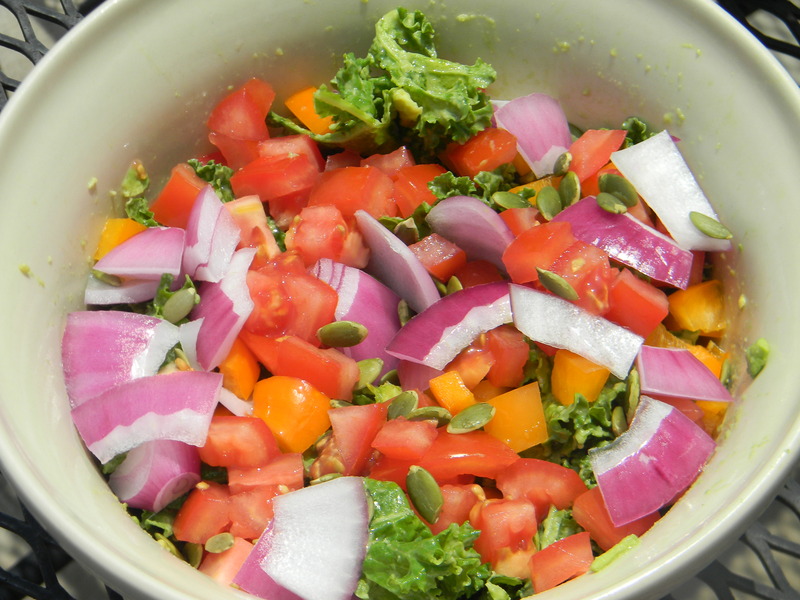 Then loaded with tomato, red onion, orange peppers and a few pepitas. Now (insert name of anonymous restaurant here), these are salads made with love!